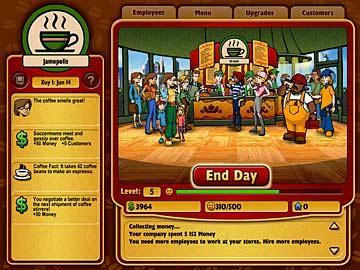 My Family Fun - Coffee Tycoon Play this simulation download now! Play this simulation download now! 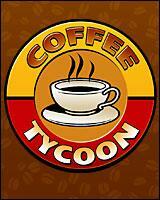 Coffee Tycoon gives sim games a jolt of caffeine! It's packed with awesome graphics, tons of features, and lots of fun! Start fresh with one store, customize your coffee business by giving it a name and choosing a logo and store design. From there, choose a city start your coffee empire, maybe New York or L.A., or if you are really daring, the coffee capital of the world: Seattle! Coffee Tycoon is filled with dozens of charming characters who will offer up their opinions, good or bad, on the quality of your store. 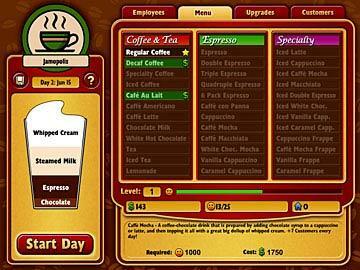 Choose from dozens of store upgrades and coffee recipes to customize your business. Hundreds of unique events and bonuses.